These days, the securitized 1031 Exchange space is experiencing slower, yet more sustainable growth, according to speakers participating in “State of Securitized 1031 Exchange Industry,” a recent webinar hosted by Mountain Dell Consulting LLC, a 1031 consulting firm in Salt Lake City. The biggest takeaway from the hour-long webinar was that the current state of the industry is stronger than it was before the Great Recession, even if growth is not quite as frenetic. One reason for the strength has been a shift from TIC offerings to Delaware Statutory Trusts (DSTs). 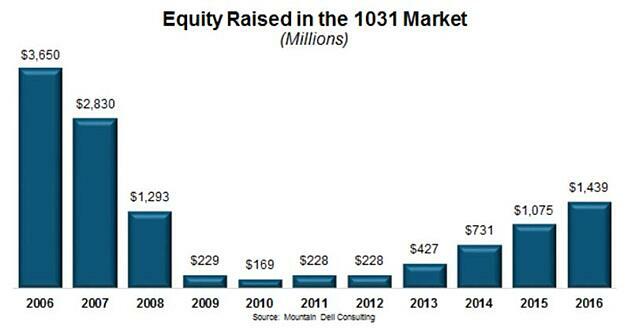 In 2006, the 1031 market was at its peak. Specifically, $3.6 billion in equity had been raised, with the number of fully subscribed programs at 341, another high. Meanwhile, the number of sponsors stood at 712. Then came the recession. In the aftermath, investments slowly picked up. By 2016, the total equity raised was $1.4 billion, with the number of fully subscribed programs at 74, with 29 sponsors3. As of Q2 2017, the equity raised for 1031 programs was $901 million, with 26 sponsors in the market. So far, 47 programs are fully subscribed4, and from what the speakers said, more is to come. And, the offering profile is shifting from TICs to DSTs. The total number of offerings, as of the end of June 2017, was 81. Seventy of those offerings were DSTs, while 10 were TICs5. “One of the things we’re seeing is a broader acceptance of the DST model by the financial community,” noted Keith Lampi, president and chief operating officer at Inland Private Capital Corp (IPCC). IPCC offers replacement properties for exchange transactions. “More broker-dealers are coming on board to embrace the structure,” Lampi said. Something else that changed over the past decade is the type of preferred investments. Office product made up the bulk in 2007. Ten years later, “Apartments are the dominant type of investment in the asset space,” Garrett pointed out. Another industry change is that investment loads – upfront fees investors pay to sales intermediaries – decreased over the past decade. “Pre-recession, we were seeing $.80 on the dollar going into the real estate,” Lampi said. “Today, what we’re closer to $.90 on the dollar actually going into the ground.” The reason? Sponsors are doing more than simply collecting investors and raising money. There is more focus on the back end of an investment and an exit strategy. One lesson learned from the downturn was that “upfront fees don’t have a meaningful ability to generate cash flow,” Lampi said. There is, however, an important strategy to reducing the upfront loads. “When you go to sell, you have to make sure your property appreciated enough to overcome those upfront fees,” Lampi said. The speakers agreed that 1031 sponsors and investors learned a great deal in the aughts; those lessons have led to better, stronger offerings and products. Could securitized 1031 investments be right for you? As with any major financial investment, it may be worth speaking with a professional and becoming educated on your options to determine if something like this is right for you. At Realized 1031, we’re happy to speak with you and help determine if securitized 1031 investments may fit with your situation and personal investment objectives.